Belize may be small, but it’s a tropical paradise with a wealth of adventure to offer. The small towns and cities that dot this lush nation all have their own unique personalities – and all are just moments from jungle adventures, ocean explorations and ancient Mayan traditions. Here are just a few to add to your vacation itinerary. Overlooking the Caribbean Sea, colorful Belize City is home to the Belize Museum, the Eco-Museum and the Riverside Tavern – owned by the country’s only brewery. An assortment of architectural styles and a melding of cultures make this former capital a one-of-a-kind destination. The Cayes of Belize are just a water taxi away, putting nature well within reach. Friendly and laid-back, “Sugar City” is a great spot for shopping and dining. The market area is always bustling, and the breakfast taco vendors make for destination dining. More than 400 species of bird call this area home, so birders may want to stop a while. A tiny, water-surrounded village perfect for bird watching and boating. Explore the lagoon in a rental boat and keep an eye out for the jabiru stork at the Wildlife Sanctuary. You can also take a canoe out to Chau Hiix, a Mayan site currently under excavation. Visit in May to experience the town’s annual cashew festival. Located on the Macal river, “Cayo” is an inland jungle town sublimely positioned for exploring Mayan ruins or trying your hand at outdoorsy activities such as caving and horseback riding. Tour Cahal Pech, Caracol and Xunantunich and check in on the Iguana Conservation Project. The nation’s capital, Belmopan is an inland city surrounded by Mayan ruins, incredible caves and winding trails. Set aside time for daytrips to the mile-long St Herman’s cave, a former ceremonial spot; Actun Tunichil Muknal (ATM), a sacrificial burial site; and Caracol, the largest ruin in all of Belize. Home to a Garifuna population, Dangringa is the largest town in southern Belize. Vibrant and festive, it’s known for its musical traditions and its frequent festivals. Once you’ve explored the town’s laid-back offerings, take a bus to the Cockscomb Basin Wildlife Sanctuary and try to spot some jaguars. A gateway to Guatemala, this diverse Garifuna-founded town offers a lively snapshot into local Belize living. Friendly and walkable, it’s rich with markets, multi-ethnic dining and the rhythms of traditional music. Take a drumming lesson, play in the waterfall at Rio Blanco National Park, then head over the border to Livingston. With its long white beach and laid-back fishing vibes, Hopkins is a casual spot for enjoying Belize’s great outdoors. There are plenty of expat bars and restaurants, as well as fishing, windsurfing, snorkeling and chartered boating options on offer. The ultimate coastal retreat, Placencia is a casual seaside destination just moments from both the water and the jungle. Long-beloved by vacationers, it’s brimming with high quality dining, luxury accommodation and artsy shopping. Stroll the famous Boardwalk, dive at Laughing Bird Caye and go whale shark spotting at Gladden Spit. Belize’s diversity of cities and towns have something to offer every traveler – and nothing’s more than just a few hours away. 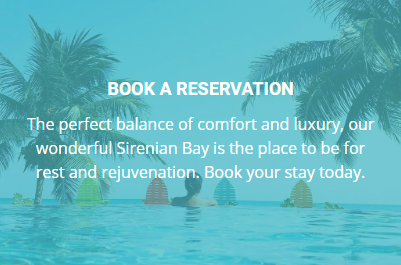 Explore the best of Belize with a vacation at Sirenian Bay.